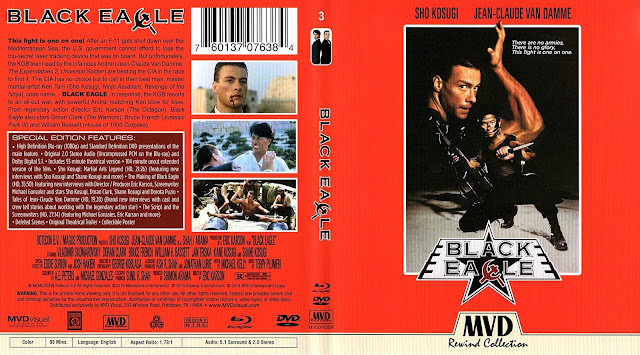 Sho Kosugi and Jean-Claude Van Damme try as they might to save Black Eagle from becoming "just another 80's action film". -Savannah Smiles (2m 55s, HD) Frame rate is off. 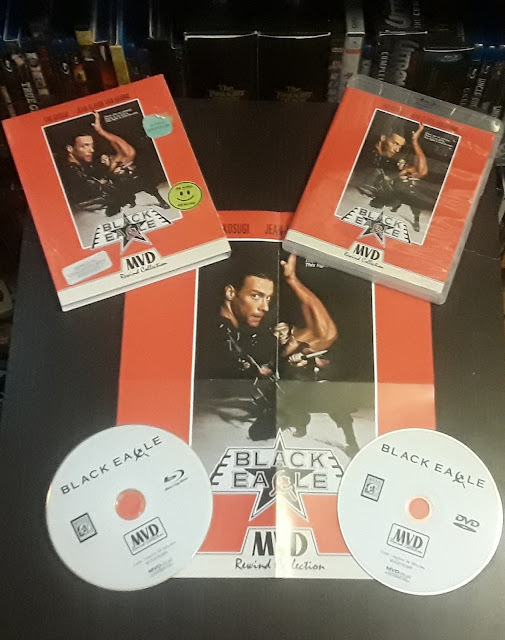 I have to give MVD credit where credit is due: they have given Black Eagle way more love than it deserves. When I got this blu-ray I was excited about the special features, but after watching them, I have realized that the money could have been better spent on another, more worthy film. Outside of the Sho Kosugi featurette, I found nothing else presented here particularly interesting. The making of Black Eagle featurette is the longest featurette here and gives us nothing that we would find fascinating. Usually, there is something that happens on set that everyone wants to talk about, but here there are no such stories. The Tales of Jean-Claude Van Damme featurette should have been a bit exciting, but the stories are all the same: Van Damme wasn’t the monster that everyone says he was. 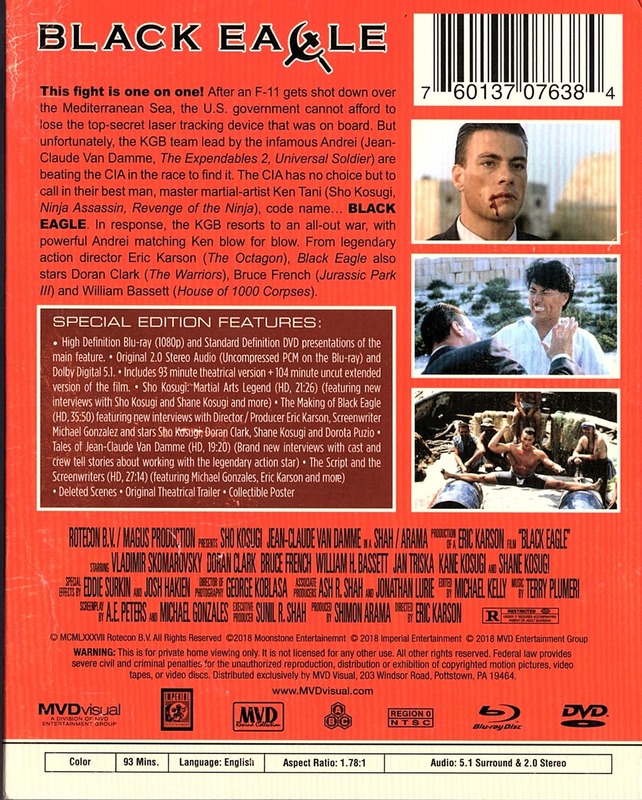 The filming of Black Eagle, much like the film itself, is rather boring and uninteresting. I am sure that there are those out there that will find these features to be interesting, but I could not. Presented in the film’s original aspect ratio of 1.78:1, this transfer should have been a home run. 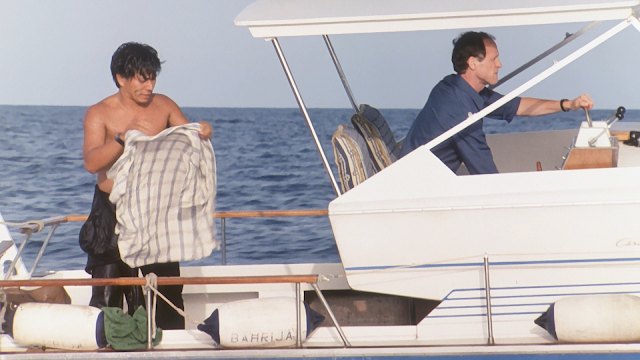 Somewhere along the way, someone decided to add a layer of DNR to the picture, knocking out most of the film’s detail. Some faces become waxy shells of their former selves. Not all is lost though as not all of the detail has been brushed away. Close ups offer a fair amount of detail while the picture does have an HD feel to it. Colors are ok, but skin tones look like they have dialed up to the “blown out” setting whenever characters step into the sunlight. The picture also has a washed out look to it. We get an LPCM 2.0 lossless track and it brings with it some issues. Dialogue, for the most part, is good, but there are times where the sound comes through with a muffled sound. There is also not much of a boost in sound leaving the score and effects lacking in power. Black Eagle is a bad film. The writing and direction are poor and the only thing that keeps this film afloat is the acting. Or better yet, the actors. 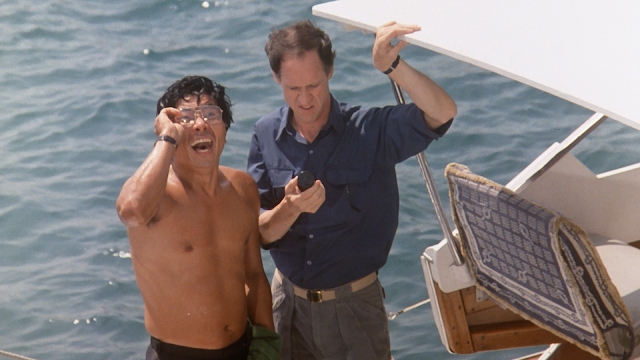 Sho Kosugi falls right into the leading man role and inserts any type of authority he can. 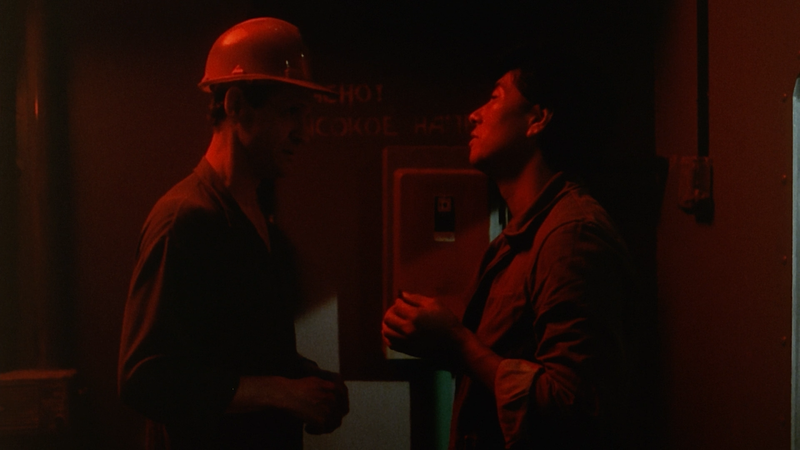 I am a fan of Kosugi, the reason why I bought this blu-ray, and it is nice to see him onscreen. I just wish that he could have been in a better film. The main villain of the film is not Van Damme as I thought he was, but he should have been. 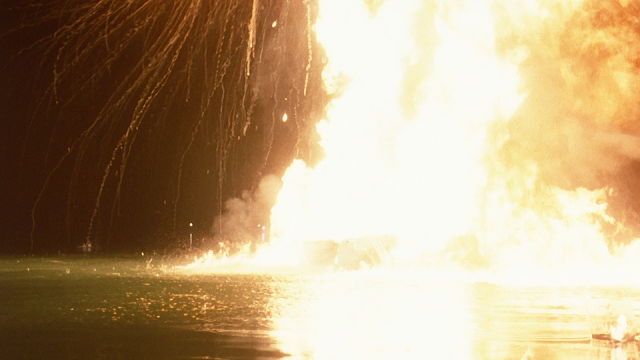 The main villain does nothing in the film while Van Damme is all over the place. This is Van Damme’s second villain role, and he brings a sense of fun to a film that is almost devoid of. 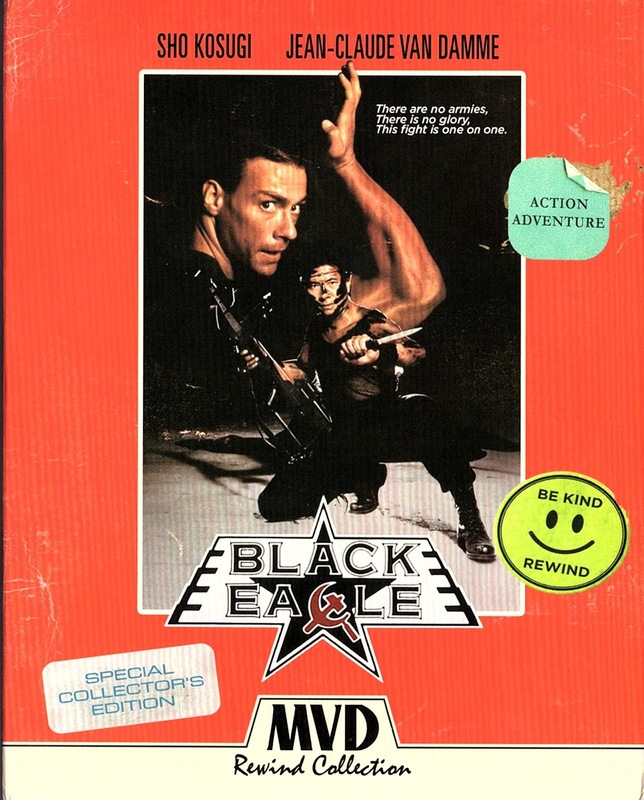 The filmmakers should have made Van Damme the main villain as he is the one that fights the good guy at the end. I can almost never take the main villain of a film seriously if he doesn’t have at least one fight with the main good guy. 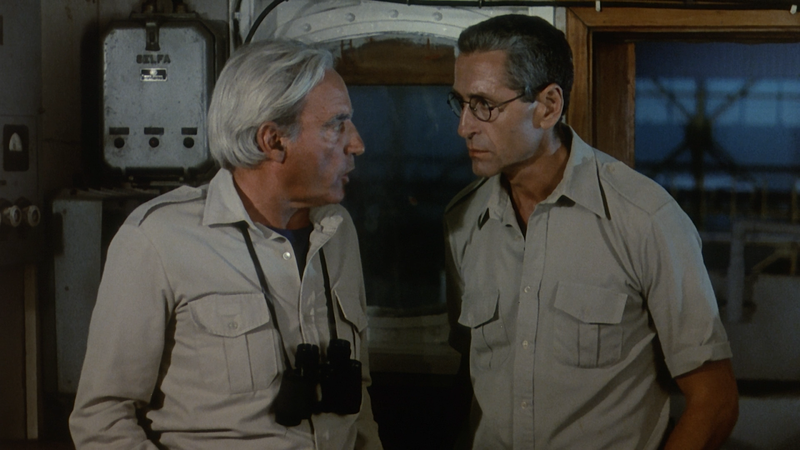 As I sit here and write this review, I am realizing that I don’t really remember too much from the film. 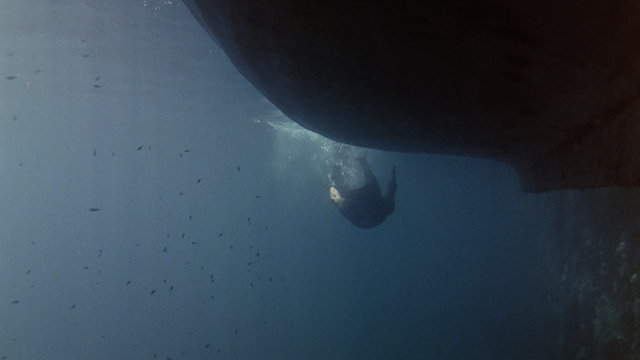 I have notes, but they don’t trigger any memories of the film like other notes to other films do. 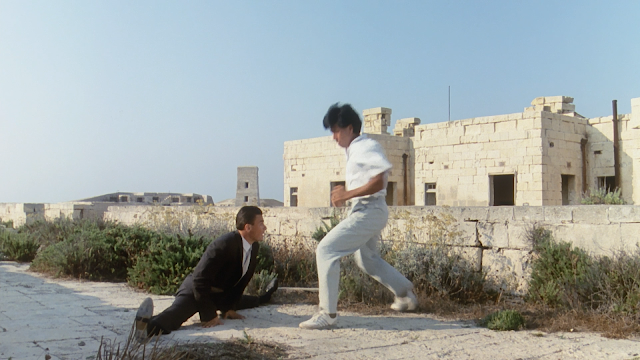 I watched this whole film and the only things that I remember are Sho Kosugi, Jean-Claude Van Damme, and the location the film takes place in. The first two things are givens, but the last one wouldn’t be all that memorable if the film hadn’t gone to great lengths to advertise the city. 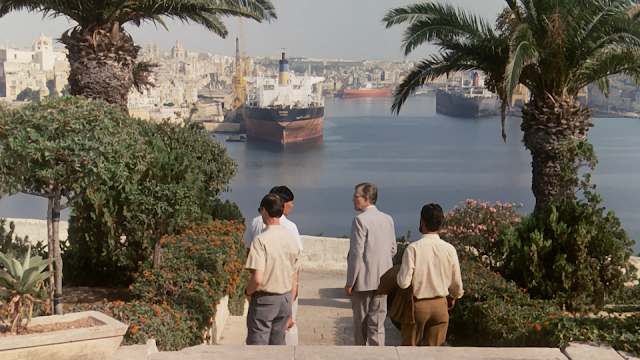 There are big chunks of this film that are devoted to the city of Malta. We are taken on tours (through the characters, not directly with us) and told how great the city is. I am sure that Malta is a great place to be, but I have better things to watch in my action films than a detailed history of a city that I had never heard of before this film. Black Eagle is the worst type of bad film in that it bores the audience to tears. The film doesn’t really have any sense of purpose or urgency. We never feel that the characters are in any kind of danger and the action scenes that we do get (which aren’t many) are stiff and dull. 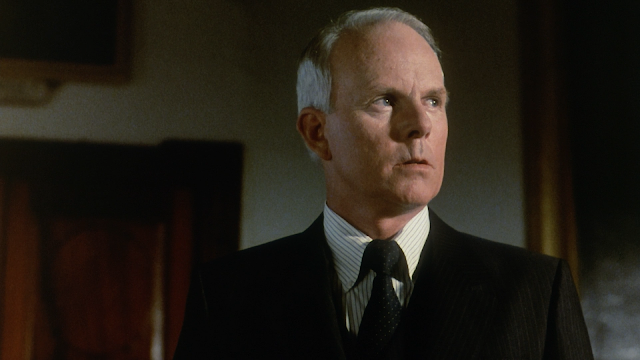 Most action films can be picked up at any point and the audience will get what is going on and who the hero and villain are within a few scenes. 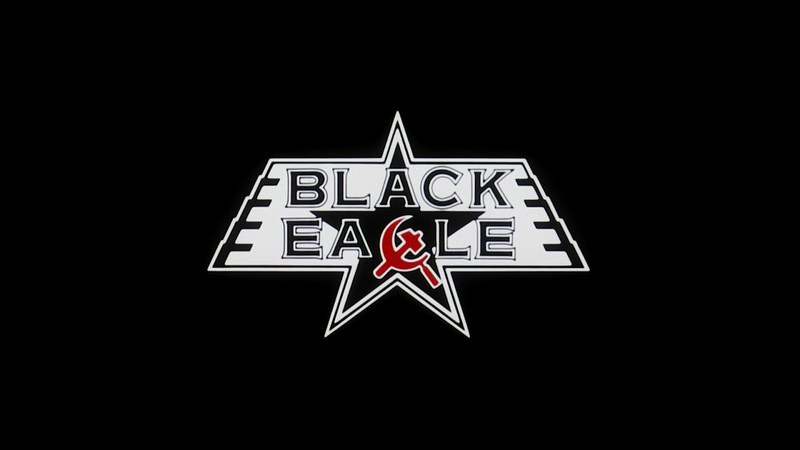 Black Eagle is hard to grasp even for the people who have been watching it from the beginning. I can not recommend this film to anyone. It is one of the worst films that Kosugi or Van Damme have been in and one of the worst action films I have ever seen. The blu-ray, from MVD Entertainment Group, is good, but not great. The picture quality is ok at best because of the amount of post-processing that has been done. The sound is ok as well with dialogue being muffled from time to time. The features are a case of quantity over quality. There is not very much that can be said about Black Eagle, but there are numerous features that try. The features are better than the film, but that isn’t saying much.